Tatweer Misr Signs an MOU with the ICSB and several world-renowned Universities to bring Global Executive Education Certificates through a tripartite agreement. Tatweer Misr, the leading real estate developer, , participated in the Annual International Council for Small Business (ICSB) MSME Forum held at the United Nations headquarters in New York. CEO & Managing Director, and ICSB Board Member, Dr. Ahmed Shalaby, was accompanied by an illustrious group of Executives, Businessmen, Presidents from various International Universities, as well as Ministers including ACA Chairman, HE Mr. Mohamed Erfan Gamal Eldin, Head of the Egyptian Administrate Control Authority and HE Dr. Sahar Nasr, Minister of Investment and International Cooperation. The conference was an effort to lay the foundation for a common global narrative on how Micro-, Small and Medium-sized Enterprises (MSMEs) can make a major impact on achieving and leading the UN 2030 Sustainable Development Goals. With the attendance of HE Mr. Mohamed Erfan and HE Dr. Sahar Nasr alongside members of the International Council, the Forum witnessed the signing of an MoU to bring Global Executive Education Certificates through a tripartite agreement, involving Tatweer Misr, the ICSB, and several world-renowned Universities, such as The George Washington University, Wilkes University, and St. Johns University. The MoU goes in line with Tatweer Misr’s strategy to create an entrepreneurial and educational hub accommodating coworking spaces, executive education, and global entrepreneurship network activities at their latest project, Bloomfields, in Mostakbal City. 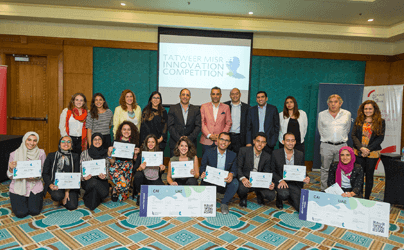 Furthermore, and alongside two other companies, Tatweer Misr has received a Humane Entrepreneurship Award, where the company represented the African region. The award was given by the ICSB for organizations that excel in business while providing a positive impact in their local communities and regions. In order to receive the prestigious award, an enterprise should empower its employees to help improve the community, while simultaneously improving the performance of the firm, bring innovative solutions to the marketplace, excel in customer service and satisfaction, a unique and sustainable business strategy, and can demonstrate how it is achieving at least one of the 17 UN Sustainable Development Goals. It’s worth mentioning that the International Council for Small Business (ICSB) was founded in 1955, as a non-profit organization devoted to continuing management education for entrepreneurs, on the belief that enlightened small business management is necessary for successful and profitable small business; which is essential to our national economies. To serve that purpose, the council develops practices for potential entrepreneurs and existing small business owner/managers through education, research, and free exchange of ideas. It also stands as a global platform for exchanging ideas and experience on management assistance for small business. Tatweer Misr has only recently been able to ratify an international day for MSME’s, June 27, at the United Nations under the auspices of the ICSB.